When Nate Weiner was promoting his solo record, Ride the Sun, he was rehearsing and touring the West Coast with Emily Elkin and Branden Stroup. It felt less like a solo project and more like a group endeavor from almost the beginning. 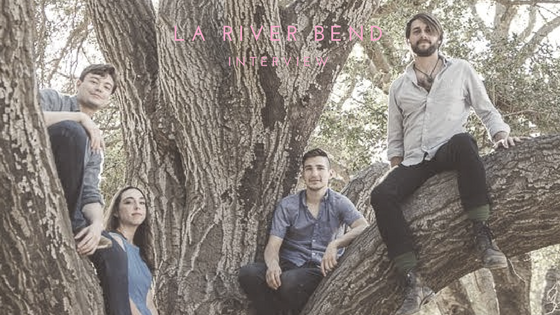 LA River Bend is a mix of intricate guitar embellishments, indie-folk facets and poetically pop melodies, along with a love for Southern California and a sometimes-challenging bend/band pun. Their debut EP, Run These Hills, focuses on the calming energy of nature in both the lyrics and the instrumentals. The EP was entirely self-recorded by Stroup, which left them with both rewarding and trying moments in the studio. While they weren’t under the pressure of hard deadlines, the music was entirely in their own hands until the bulk mixing process. They had the opportunity to listen to their own tracks at their own pace, learn from one another and produce music that best suited them as a whole. It was mixed at Val Garay's The Barn Studio in Topanga Canyon and ultimately mastered by Eric Boulanger at a setup on the Sony Pictures lot. The mastering process took only a day, and the finished product was a contemporary, fresh take on the indie-folk genre. The five songs chosen for the EP – “Summer Wind”, “Mountain”, “High Off of You”, “Fighting the Night” and “Don’t Get Lost” – were the strongest of the 10 recorded tracks and the band felt they gave the best representation of their sound. The leading single, “Summer Wind”, includes remarkable three-part harmonies and anthemic chorus while “Fighting the Night” breaks down a narrative of coping with loss. The release of Run These Hills is a unique approach to various sounds and harmonies, and LA River Bend is a unique approach to the combining of genres. As they take over the world one harmony at a time, their family-like fan base is sure to grow.